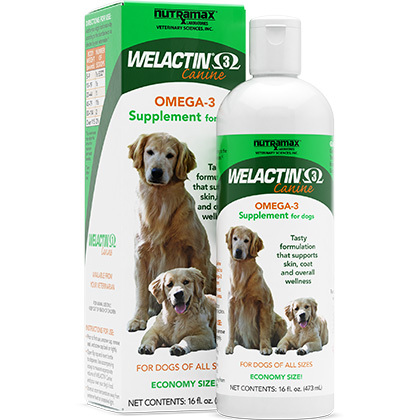 What is Nutramax Welactin Omega 3 Canine? Nutramax Welactin Omega 3 Canine is a high-potency fish oil supplement rich in omega-3 fatty acids, EPA (eicosapentaenoic acid) and DHA (docosahexaenoic acid) derived from cold water fish. Available as liquid or softgel caps, this tasty formulation is easy to administer and has a flavor most dogs love. Nutramax Welactin Omega 3 Canine Softgel Capsules also contain natural peppermint to minimize fishy breath from fish oil. Nutramax Welactin Omega 3 Canine supports skin and coat health, renal function, brain health, vision, and nervous system function. There are even more benefits for dogs, including the support of normal heart rhythm, joint function, and immune system function. Support your pet's overall wellness with Nutramax Welactin Omega 3 Canine. NOTE: Nutramax Welactin Omega 3 Feline Liquid and Softgel Caps are also available for cats. How does Nutramax Welactin Omega 3 Canine work? 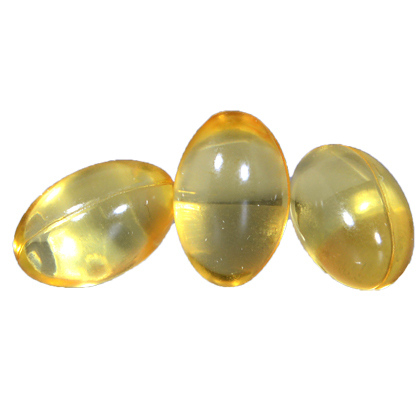 Nutramax Welactin Omega 3 Canine Liquid or Softgel Capsules contain cold water fish oil high in omega-3 fatty acids. Omega-3 fatty acids are known to support overall good health in pets, including skin and coat health, renal function, and nervous system function. Nutramax Welactin Omega 3 Canine provides additional benefits, including the support of normal heart rhythm, joint function, and immune system function. For pet use only. Keep out of the reach of children and pets. Nutramax Welactin Omega 3 Canine is a rich source of omega-3 fatty acids derived from cold water fish. Your veterinarian may adjust the suggested dosage levels below based upon your pet's needs. 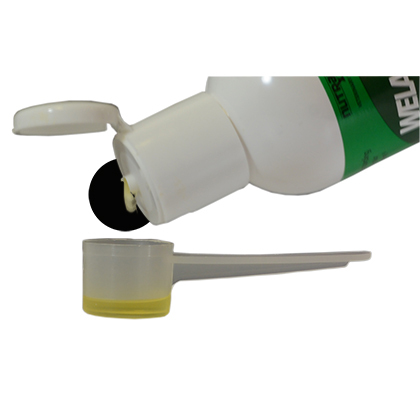 Prior to the first use of Nutramax Welactin Omega 3 Canine Liquid, unscrew the cap, remove the seal, and screw the cap back on tightly. Open the flip top and invert the bottle to dispense. Use the accompanying scoop to measure the appropriate volume of Nutramax Welactin Omega 3 Canine Liquid (based on the dosage guidelines below) and pour it over your pet's food. Nutramax Welactin Omega 3 Canine Softgel Capsules may be given to your dog by mouth or punctured and squeezed to dispense the contents over your pet's favorite food. While using Nutramax Welactin Omega 3 Canine, look for a response in your pet's general appearance, activity level, attitude, appetite, and alertness. Other Ingredients: Fish oil and mixed tocopherols (a preservative). Other Ingredients: Fish oil, gelatin, glycerin, natural peppermint oil, and mixed tocopherols (a preservative).